CAIRO: Egypt mourned on Saturday as the death toll from a gun and bomb assault at a mosque rose to 305, including children, in the deadliest attack the country has witnessed. The state prosecution said up to 30 militants in camouflage flying the Islamic State (IS) group's black banner had surrounded the mosque in North Sinai and proceeded to massacre the worshippers during weekly Friday prayers. Twenty-seven children were among the dead, it said. IS, which is conducting a deadly insurgency in the Sinai, has not claimed responsibility for the attack, but it is the main suspect as the mosque is associated with followers of the mystical Sufi branch of Sunni Islam whom it has branded heretics. President Abdel Fattah al-Sisi declared three days of mourning and vowed to "respond with brutal force" to the attack, among the deadliest in the world since the September 11, 2001 attacks on the United States. "The army and police will avenge our martyrs and return security and stability with force in the coming short period," he said in a televised speech. Hours later Egyptian air force jets pursued the "terrorists and discovered several vehicles used in the terrorist attack, killing those inside near the vicinity of the attack," an army spokesman said in a statement. The state prosecutor's office said in a statement that 305 people were killed and 128 wounded in the assault on the mosque roughly 40 kilometres (25 miles) west of the North Sinai capital of El-Arish. It said the attackers, with long beards and hair often seen on jihadists, had arrived in five all-terrain vehicles to surround the mosque. 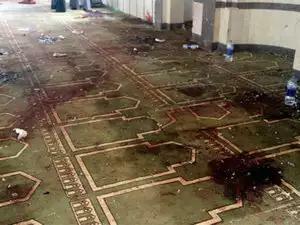 Witnesses said they heard gun shots and explosions before the assailants entered the mosque, according to the prosecution. One of the wounded, Magdy Rizk, told AFP assailants wore masks and military uniforms, and that extremists had previously threatened people in the area. World leaders voiced outrage. US President Donald Trump denounced on Twitter the "horrible and cowardly terrorist attack on innocent and defenceless worshippers". Sheikh Ahmed el-Tayeb, the grand imam of Cairo's Al-Azhar, Egypt's highest institution of Sunni Islam, condemned "in the strongest terms this barbaric terrorist attack". IS views Sufis as heretics for seeking the intercession of saints. The group has also killed more than 100 Christians in church bombings and shootings in Sinai and other parts of Egypt, forcing many to flee the peninsula. The group also claimed the bombing of a Russian plane that killed all 224 people on board after takeoff from the Egyptian Red Sea resort of Sharm el-Sheikh on October 31, 2015. The military later conducted air strikes on the attackers, killing their leader.